Our kitchen pantry was a disorganized disaster. I stuffed lunch boxes in the upper shelves, our kids housed their leftover candy in buckets, and I stuffed cardboard cereal boxes where I could fit them. It is a small pantry, its width is right around 24”. Originally we considered working with the wire shelving, but my husband and I decided to improve the function of the space with deeper wood shelving and 2 u-shaped shelves along the top. This kitchen pantry was a “long weekend” DIY project. We started it on a Saturday night and finished it on Tuesday (with breaks!) My husband designed and installed the shelving. I painted the walls and stained the wood shelves. I also installed new rubbed bronze hinges & door knob because it seemed like the right time to remove the shiny 1990s brass. All in all we gave our kitchen pantry a makeover for under $300! That price includes construction supplies and organization supplies (article on that here). 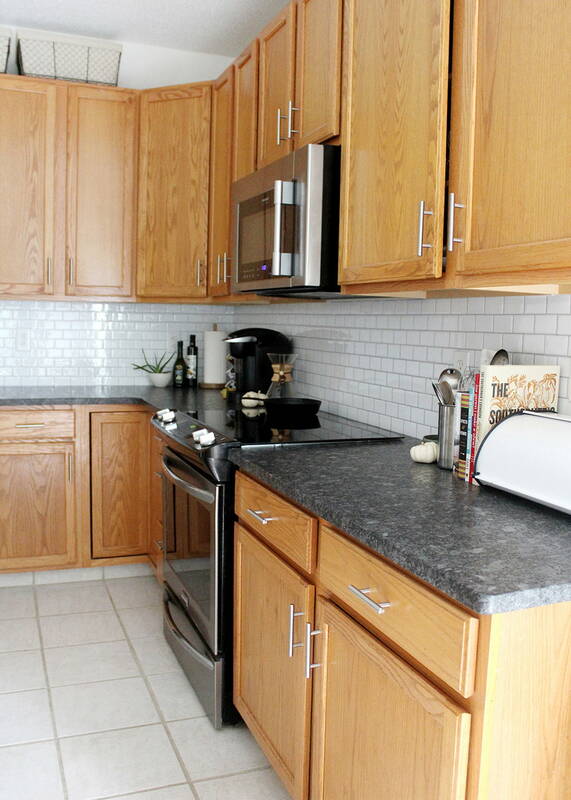 When we purchased our home 4 years ago the kitchen had beige laminate countertops, a high island, and no backsplash (other than a small laminate edge). I spent a good deal of time deciding our new backsplash because #smallbudget, and along the way discovered several interesting backsplash ideas. In the end we went with a peel & stick subway tile. A friend showed me this tile material in grey and I was impressed with the tile texture and glossy finish. I am a visual person and need to see examples to make a decision. I wrote this post with that in mind—hopefully the pictures will help you decide if a peel and stick backsplash is right for your kitchen. Read this article for pictures of our peel and stick subway tile backsplash with 5 practical installation tips!